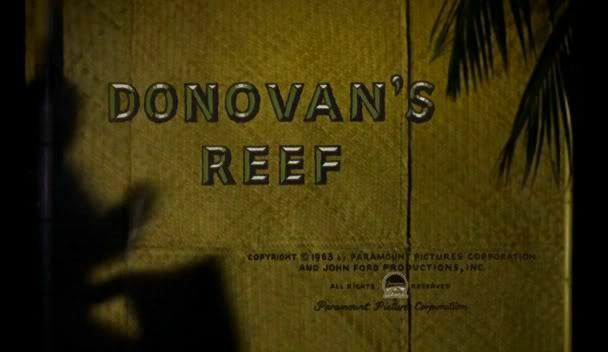 ONLY an ancient hermit would believe that the director John Ford and his writers, Frank S. Nugent and James Edward Grant, were serious in their approach to “Donovan’s Reef,” which turned up yesterday like a welcome port in a storm at the Paramount, Trans-Lux 52d Street and Brooklyn’s Metropolitan Theaters. For this running account of Pier 6 brawls, miscegenation, romance and religion that disrupt the idyllic life on a post-World War II South Sea island paradise is sheer contrivance effected in hearty, fun-loving, truly infectious style. Mr. Ford has been involved with movies for 45 years, and his associates, including his principals, are no tyros either, so they cannot be blamed for using what would be film clichés in less practiced hands to fashion a fable to tickle the funny bone and give us a picturesque change of venue at little expense. They have taken us to the verdant atoll of Haleakoloha—the film actually was shot in vivid color on extremely photogenic Kauai, Hawaii—where an icy Boston heiress has gone to search out her seemingly errant father. 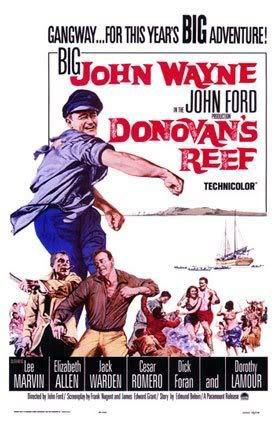 That staid lady not only discovers the beauties of the palm-studded island but also romance in the guise of John Wayne, an erstwhile heroic hand on a Navy destroyer who decided to stay on after the war and is now the owner of the island saloon of the title, among other properties. Revealed also are such facts as her father’s desertion of a cold Bostonian wife for a warm Polynesian princess, now deceased, by whom he has become the sire of three cute kids, and his humanitarian work as the sympathetic, self-effacing medico for all the natives. 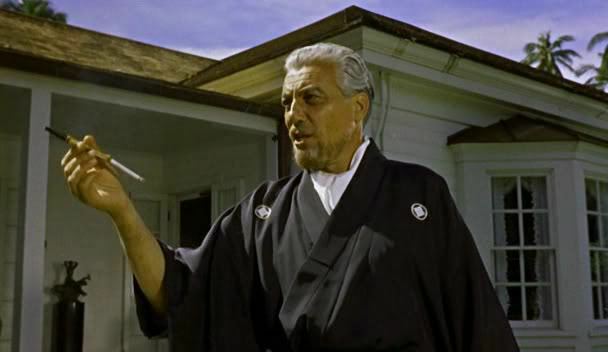 There is Dorothy Lamour, again familiarly attired in sarong and muu-muu, who is the love life of Lee Marvin, Mr. Wayne’s friendly enemy in brawls; Cesar Romero, a musical-comedy governor of this colorful back-wash, and a kindly priest, who teaches Brahms to the kids and the catechism to the islanders. Of course, there is a modicum of obvious obfuscation as Mr. Wayne and his cohort try to keep the truth from the visitor, who, they imagine, will not quite understand. Eventually, and to no one’s surprise, they all find that she is indeed warm and understanding. Honesty and altruism win out before the varicolored dusk sets over the frangipani and the lagoon. More important, Mr. Ford and his devoted team are not overlooking that movies should move even though the dialogue is colloquial, funny and manly. Everyone, from Elizabeth Allen, as the starchy Bostonian whose reserve melts after being exposed to the amorous assaults of Mr. Wayne and the charms of the happy folk around her, to Miss Lamour, is constantly involved in physical action. 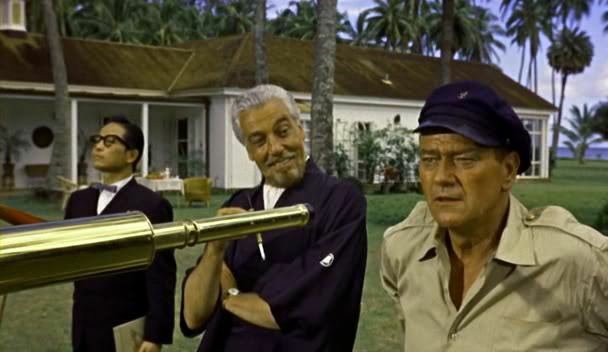 Mr. Wayne belts Mr. Marvin, the Messrs. Wayne and Marvin good-naturedly take on an Australian Navy crew; the kids go water skiing; Mr. Wayne is forever tearing around Haleakoloha in a jeep, and Miss Lamour is tossed into a pool. Miss Allen gets a watery greeting at the outset when she lands in the lagoon on missing her step off the schooner that brings her to her destination. She is never the proper Bostonian after that. Mr. Ford, to summarize, is kidding, but he also has his viewers in mind and he does not shortchange them. Everything ends as happily as a trite travelogue, and his cast behaves in customary but satisfying style. 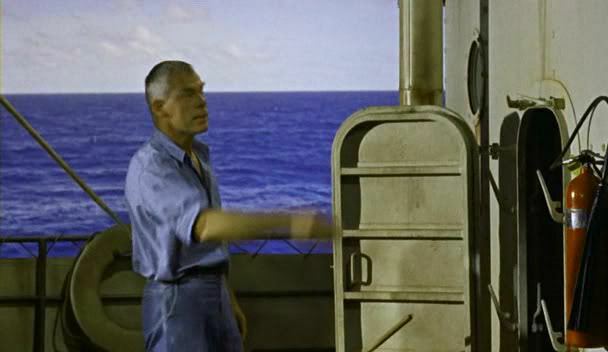 Mr. Wayne, in yachting cap and dungarees, is no different from Mr. Wayne at ease with 10-gallon hat and six-shooters. He is still as massive as a moose, tough, laconic and as handy with a dame as he is with a left cross. Miss Allen, a graduate of Jackie Gleason’s television series — remembered for the classic line, “And away we go!” — is a lissome, brunette beauty who takes to this uninhibited stuff like a duck to water. As Mr. Wayne’s longtime sparring partner, Mr. Marvin makes an agreeable, easygoing foil. Miss Lamour’s contribution is slight, but she obviously appreciates the free-and-easy spirit of the whole wacky affair. Jack Warden is merely serious as the dedicated doctor, and Jacqueline Malouf, Cherylene Lee and Tim Stafford, as his happy, half-caste offspring, are winning youngsters. There is no Haleakoloha, but they and Mr. Ford certainly make it an unbelievable but explosively nice place to visit.